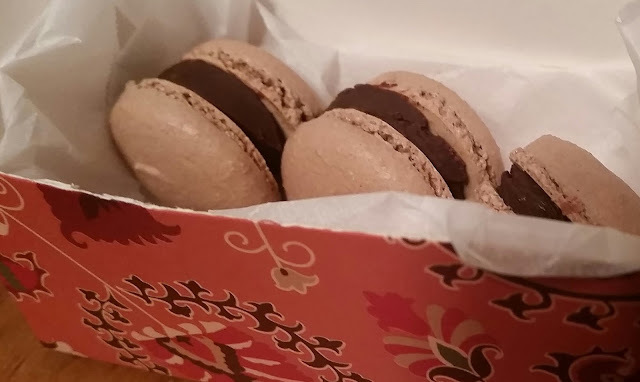 For a while, I've been interested in making macaron, those delightful little cookies made with almond flour and meringue, sandwiched with ganache or buttercream...yes, you can get some frozen at Trader Joe's that aren't so bad, or some refrigerated ones from Costco that are actually quite good, but you know, I like to try things out. They're rather technical, though, so I decided to look for a class one day and found that the lovely Thip of Bonbini SF offers them every Sunday in San Francisco! I've been practicing at home like a good student, much to the delight of my coworkers. The class was capped at 8 people, cost $85 for three hours, and included hands-on participation as well as some demos. 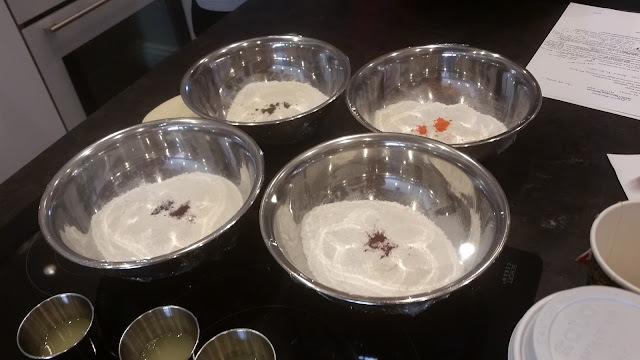 Chef Thip organized the time very well, starting right on time and leaving time for tasting at the end. 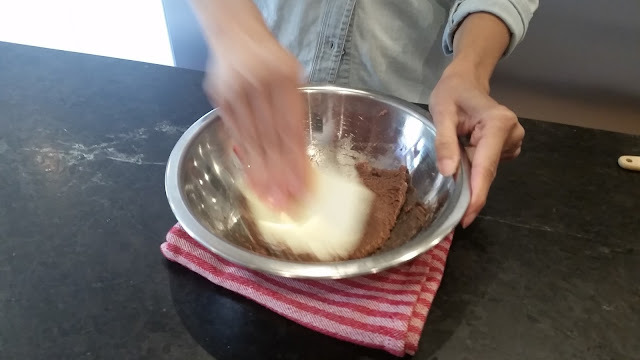 She had pre-measured amounts of almond flour, egg whites, confectioners' sugar and food color so that we could work in pairs to learn the proper folding technique after watching her demo. Had I not learned from her that it's OK to really smear it in this case, I would have struggled for much longer with it when trying at home and messed up a few extra batches. 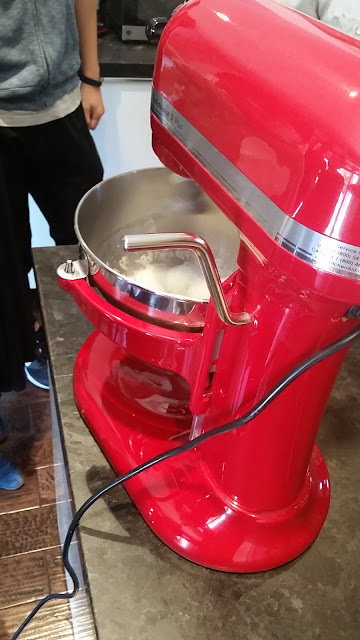 We then learned how to make an Italian meringue, and I definitely benefited from the demo from a professional even though it was something I'd done before. 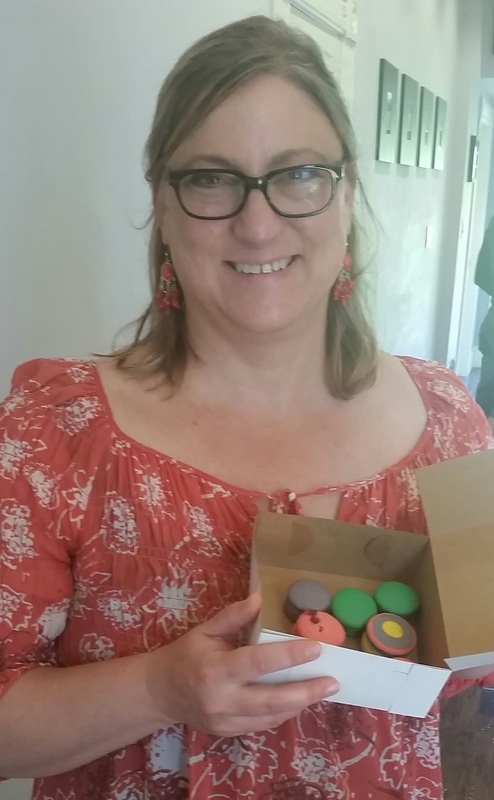 She also explained why it was preferable to a French meringue for macarons, despite the macaron being a French cookie. The great pastry chef Francois Payard is also of this opinion, and now I understand why. Sign up for the class to learn! I still covet her powerful KitchenAid, much as I love my smaller one. We got to work with our partners to fold in the meringue until achieving proper macaronage, pipe out the macarons and put them together with different flavors of ganache. My partner and I got the tastiest one, in my opinion, lemon poppyseed. These last few steps left my hands a little too sticky for taking photos, but Thip's instructions (and recipes for cookies and fillings) left me with the confidence to give it a try at home. Plus, a very generous snack on the way to my next stop for the day! If that wasn't enough, she was gracious enough to tell us to email her with questions and pictures, and I have taken her up on her offer as I work on my technique. Pictured: Raspberry Rose, Chocolate Mint, Lemon Poppyseed, and Salted Caramel flavors.